So get this. 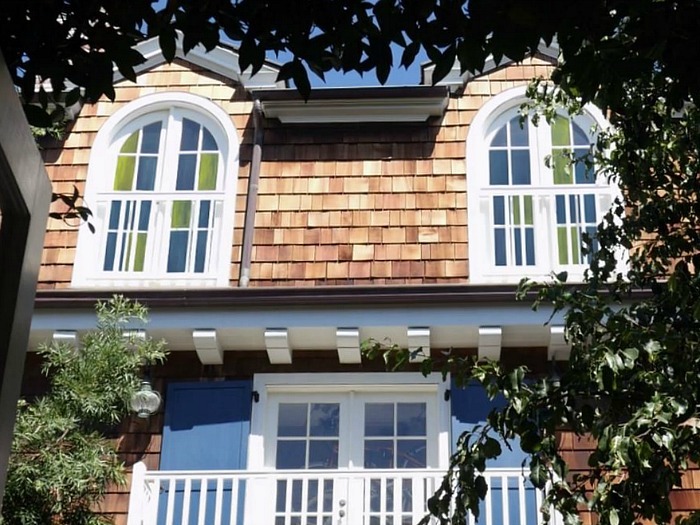 I came across an old post I’d written in 2011 about a house designed by architect Steve Giannetti in Broad Beach, California, and realized it looked very familiar. 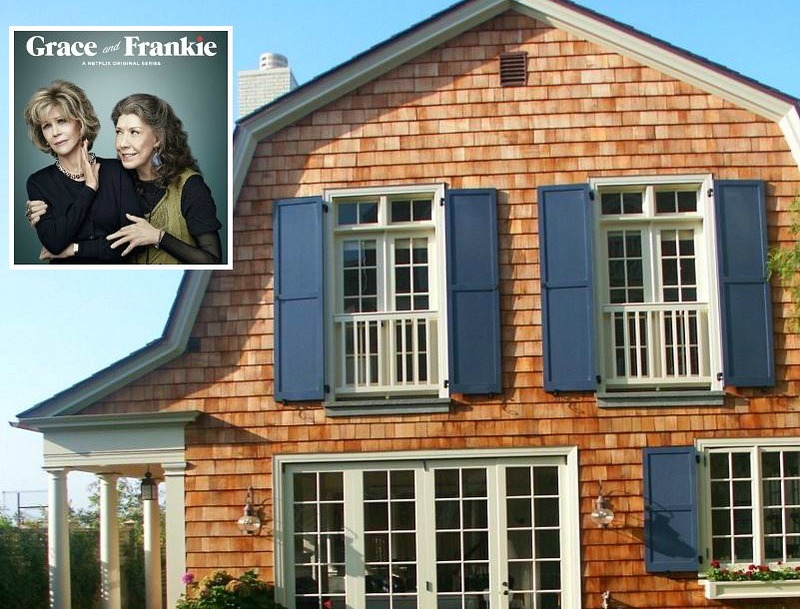 In fact, the exterior looked just like the house on Netflix’s hit show “Grace and Frankie.” What?! When I compared the real interiors to the set photos, I couldn’t believe how similar they were. Take a look and you’ll see what I mean! When I first wrote about the sets from the show, I found the house on Google Maps but no interior pics. Imagine my surprise when I came across the interior photos right here on my own blog! The exteriors of this house were used for the show. The interiors were recreated on a soundstage. It’s clear the sets were inspired by the real interiors. 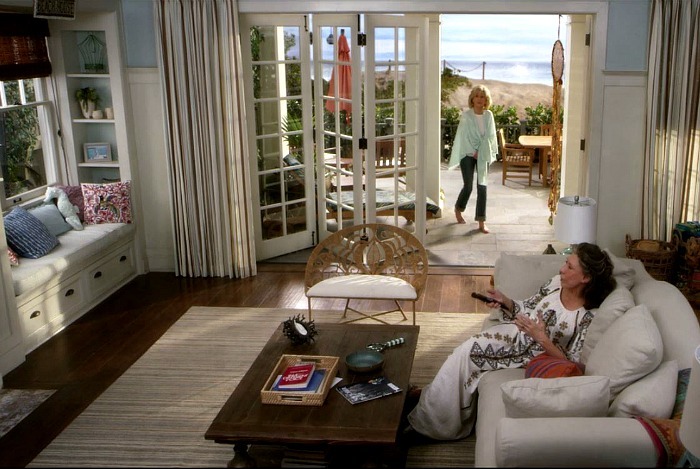 Jane Fonda and Lily Tomlin play Grace and Frankie, an “odd couple” of friends who move into the beach house together after their husbands Robert and Sol (Sam Waterston and Martin Sheen) announce that they’re gay and in love with each other. The blue cabinets in the kitchen are right on trend, and perfect for a beach house. It has 4 bedrooms, 4 baths, and 3,896 square feet. They didn’t show much of the upstairs in the first season. Here’s hoping we see more in the second! We often see scenes that take place here, in front of the garage. 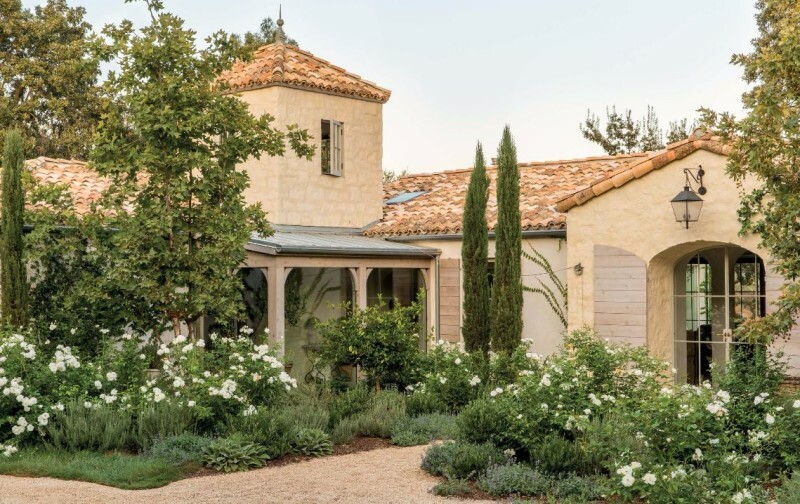 Real house photos via Giannetti Home (construction by John Finton; interiors by Trip Hanesh). Are you enjoying this show and the sets as much as I am? 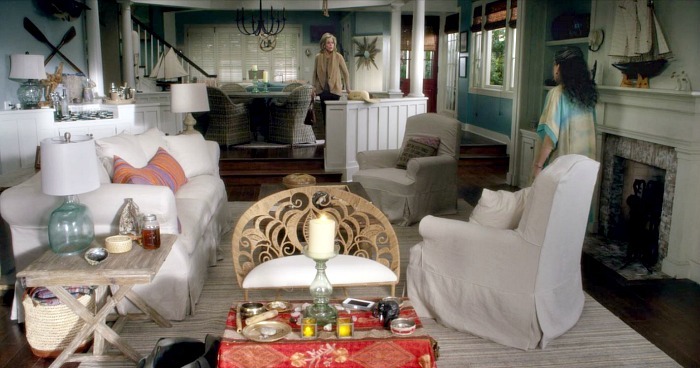 I like Robert and Sol’s house, too, which is pretty fabulous. First off.. I LOVE this show! Actually getting ready to watch Season 2, it’s Friday and just came out! Martin Sheen & Sam Waterson..OMG..LOVE THEM… Lily, a genius & to cast Jane also..totally AMAZING! Next the house! Just put me in that bathtub, that’s all I gotta say. Heaven, to see and hear the ocean..DREAMY!! The only thing I would change, that 1/4 wall that separates the entry & round dining table..open it up. At work now.. but always check your site b4 I actually start (seriously do)! Shhh, don’t tell! Ha ha, I love how you more interested in the houses then the actual characters/plots. I do that too! P.S. – Could you do a post on the house from the Robin Williams movie, “What Dreams May Come”? I’ve been looking for decent pics of that house from that movie for years. YEARS I tell you. YEARS!!! I don’t think I’ve seen that one, Elena. Thanks for the suggestion! Love the show..love the house..thanks for the heads up about today! I am so behind with my TV watching… Love the house though! So classic and beautiful! I love this house, and I can’t wait to start watching the new season tonight. Thanks for the real inside pictures. I am remodeling a very, very small house near the beach, about the size of Frankie’s studio. The paneling, fixtures, of course the decorating are all going into the Pinterest idea page. I LOVE the vent covers. Love the house and show! I am not surprised to learn it is a Giannetti house, always a treat to see their work. Part of my Mother’s day requests is to watch Grace and Frankie Season Two at my leisure!!! Be still my Hampton’s heart. I love his work. Haven’t seen the show, but now that I’ve seen the house, I’ll have to watch! Thanks for posting and Happy Mother’s Day to you. I binge-watched season 1, and it’s been a long wait for season 2! This house is absolutely gorgeous. I love the tub too, and the woodwork, and the view, and pretty much everything. 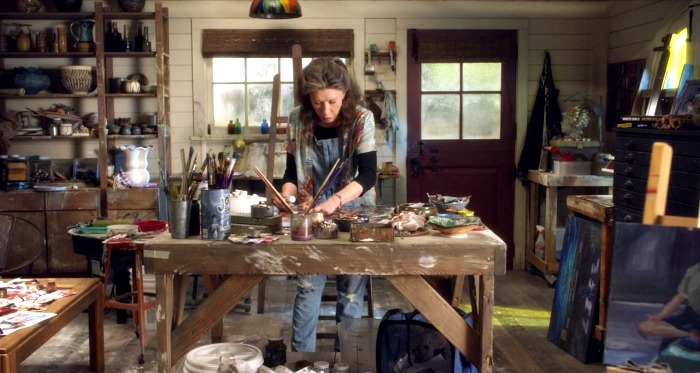 If I had an art studio that size overlooking a pool and the beach I’d be in heaven! It is one of my fav shows too, possibly because my age is getting closer to theirs…did i just say that ? from the show to the real thing..
the whole open concept thing with open kitchen, dining, living make the house too stressful to look at, too congested too…..
the bedroom and the bathroom are relaxing, peace and quite ……. Hi all, is it common on sets to change out the furniture? 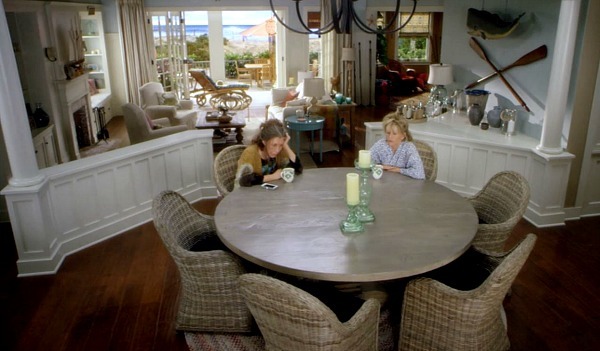 The dining room table and chairs are changed out (one is them sitting at a round wicker style table and chairs and the other has them sitting at a different round table with x- back chairs for a different scene. That’s a lot of $ they spend on changing furniture! I love that you caught that! That was from a flashback scene, and they changed things up a bit to show it was from years earlier. LOVE this show and so excited to see Season 2.
wow! this is a first !!!! you already had the house on your blog. unreal. what fun!!!!!!!!!!! Hi Julia, I’m sorry I missed your Birthday, I’ve be accused by my daughter that I forgot what day it was (birthday) you’d think this could not happen because I was there …. Hah. I hope your birthday was everything you wished for and more. I have not seen this show as yet hoping it will be aired here soon. The house is just beautiful, I love the bedroom and bathroom and all of the above. Thank you for sharing beauty. Have a wonderful Mothers Day. Till next time, regards Esther from Sydney. PS I’m trying to play down my 60th which is just around the corner. Julia: Bless you for going to this effort. Love these photos and the additional information. As usual, you come through for us! Binged on Season 2 and now feel so sad it’s over. This show is simply brilliant for those of us of a certain age. Sometimes I laugh so hard I cry. I was never a Jane Fonda fan before but now I love watching her along with Lily. Of course, the house is the real star of the show. Every time the camera pans the beach and that rock sea wall I curse living in the Midwest in the middle of a flat state! Thanks for the pics! Gorgeous home; both on the show and in reality. I think I like the real thing marginally more though. The real house has more red, which I think distinguishes it from the usual blue and white seaside theme. Love those red director chairs in the kitchen. 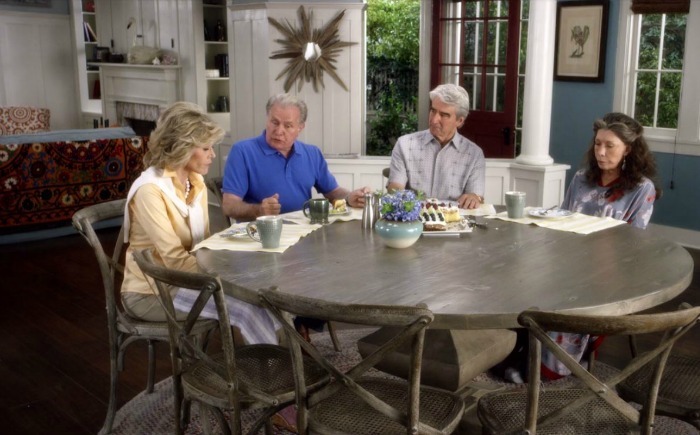 Haha this is just so funny; I visit your blog regularly, and specifically came here today to see if you had anything on the house from Grace & Frankie. Lo and behold, right there up front! You do a great job of showing what folks like me are looking for! Thank you! I do have one question about the house that maybe you could help answering: I Keep having Trouble imagining to where exactly the poolhouse and pool is placed. On the Show and the Pictures you posted you can see the Beach Side of the house and the Garage side of the house, but where exactly is the pool placed? On the Show there doesn’t seem to be enough room on the sides of the houses since it is placed between two other houses and in real life it seems to be the same Thing. It really is confusing, I agree! An aerial view would probably help. 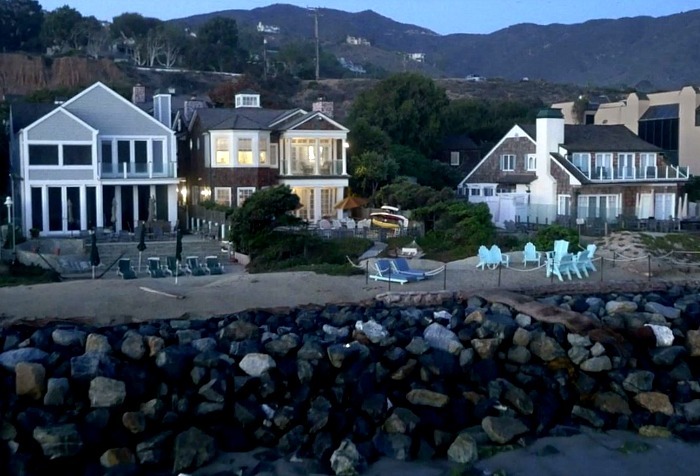 There are two buildings — the garage with pool house off the street and the beach house on the water. The pool is situated between the two. LOVE the house too! What is up with the awful photoshopped??? Polkadot brick chimney in Season 1 Episode 11 with about 3:39 left in the show?